which can run in the background and has the ability to automatically transfer the logs to quite a few targets. In my case, directly onto my owncloud which runs on the same webserver as the LeafletJS-Site, so I can use the uploaded files directly from there. In the app there’s no way to see where other users are (if more than one user uses the infrastructure). It’s still possible on the website though. So, the idea of having a log where I have been at a given time or being able to show my friends where I am is quite appealing. But giving all my data to a some big corporation (regardless of the matter if this data is used there or not) isn’t. Because of that I built my own Latitude-/Google+-Locations clone completely with free and open source components. Push our Location to the MQTT broker (and thus being able to share our location with other OwnTracks users on the same server). Store the data from the MQTT broker in a MySQL database to have a permanent log. Push the latest location from the MySQL to a website. On my mobile I’m using OwnTracks. This requires a MQTT broker on the server side. There are quite a lot public ones of the out there, but as I said I wanted to use my own infrastructure. The daemon I’m using for this is Mosquitto, which is bundled with the most linux distros. OwnTracks needs an encrypted connection, so you have to generate certificates (or get one from e.g. CACert.org) and chance the mosquitto.conf to activate is. You should also add an user to an mosquitto password storage for every user who will be using this server. Now you just have to configure your server, port, username and password in OwnTracks and you’ll already be able to share your location with other users on the same server using the app. To transfer the MQTT data into a MySQL I use the m2s script from the OwnTracks team. Here you just have to fill in your details in a setting.py (host, (plaintext) port, user and password for the MQTT broker and host, user, password and databasename for the MySQL) and run it. Done. Now you have a permanent log of your location history. To use the stored data you can for example use gpxexporter.py which is part of m2s and creates a gpx track out of the data. 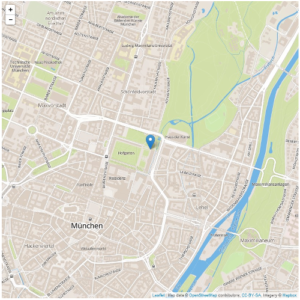 To show my location on the web I write a small gpx track (using gpxexporter.py), push this on my webserver, take the latitude and longitude of it’s last entry (using php) and show this in an Leaflet view. */5 * * * *     cd /path/to/m2s; ./gpxexporter.py -u username -d devicename -f `date --date="1 day ago" +%F` -t `date +%F` | ssh servername "cat > /path/to/web/track.gpx"
If you have more than one user using your server and you’d like to display all on the map, you would have to create multiple cronjobs (with different user/device entries). Update: It looks like mapbox regularily changes the Name/ID of it’s example map. So it would be best to create a (free) account at mapbox and change the id in my example code to your own and also add your access token.